So here I am with part two, you can read part one here. Let's talk about the masters from fourth and fifth years. First up was Barbara Vrbančič with fabulous red sequined blazer. It reminded me of Dorothy from Wizard of Oz and her ruby slippers. She really used nice colors and played with patterns. 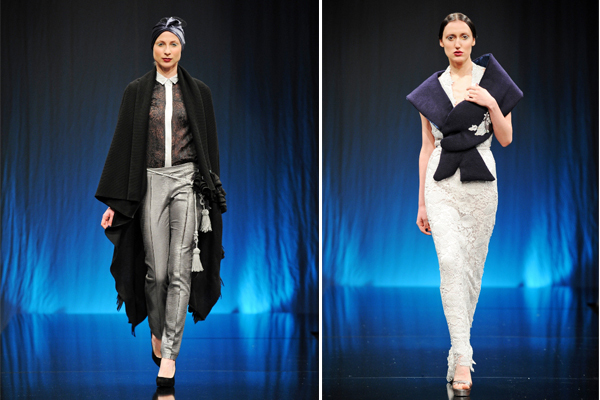 I also liked Janja Videc and her black and white collection with leather details of course. Another great one was by Barbara Dermota. Interesting creasing on the pants and love that bright blue color. The queen of evening and cocktail dresses Urša Drofenik. Inspiration is beautiful delicate lace with small flower details. I'm sure every woman would feel beautiful in her dress. These are probably the only pieces that I liked by Mojca Celin. The first one because of the nice silver pants and warm long sweater/cape. The second one without the scarf or whatever that is, the dress itself is really pretty. Not much else to say really, the last show didn't impressed me that much. I won't even talk about the others but you can check whole collections here. I don't like to be critic of the designs because every designer have so much talent and there is also a lot of hard work behind it. And also because everyone has their own taste. Here in Slovenia it's very hard to succeed if you are an artist so congrats to everyone. I unfortunately had to skip day three so that's all from me on Philips Fashion week. Which one is your favorite? Please share it in the comments below. Wish you all a great start of the week! wow this must be so exciting, I'd love to go to a fashion show and you blog about them! Best job ever!